As a complete contrast to my previous card from the wide open spaces of Africa, here is Hong Kong, exactly as I imagine it. The name Hong Kong is an Anglicised attempt to pronounce the Chinese name which means Fragrant Harbour, possibly because of the fresh water delivered by the Pearl River, or possibly because of the incense that was stored around the harbour before export. There is a novel, "Fragrant Harbour" by John Lanchester which covers the period just before Britain handed Hong Kong back to China in 1999. This is a beautiful postcard. I really can't wait to go to Hong Kong one day. I would love to be there sampling the food like I see on the Travel Channel. 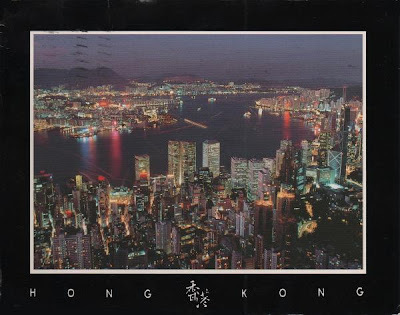 Having just returned from a five day visit to Hong Kong, spent largely around Victoria Harbor, I delighted in seeing this postcard. I did a blog post on the famed evening light show which I saw this visit for the first time...and, also, a post on my feast at T'ang Court....scrumptious, Sheila....expensive but worth that one splurge. I have never been to Hong Kong but it is somewhere I would love to visit one day. It always looks so vibrant and interesting. Beautiful. Lots of people in a small space. Exotic to me.